The house across the road, no 34, was built during the WW1 Battle of the Somme in 1916, hence its name. George Troup designed the house for his sister and her husband, Charles Moore. Archie McMahon was the builder. Somme House Photo by Hannah Sutton, 2009. The house built in 1916, and named to commemorate the soldiers killed in the Battle of the Somme during World War 1 in the same year. The builder, Archie Mc Mahon was a brick layer and plasterer and built quite a few houses in Plimmerton , including Turville house in Motuhara Road. The land on which Somme House is situated was once part of an estate bought by George Troup in syndicate with Charles Moore and James McKay. This estate extended up to Cluny Road and included Motuhara, Moana and Airlie Roads. In 1909 they subdivided the foreshore area and sold off sections over the subsequent year. Charles Moore was married to George Troup’s sister, Christina, and they chose the section at 34 Moana Road. Troup designed their house in the style of his own at 75 Motuhara Road. The builder, Archie McMahon was a brick layer and plaster and build a quite a few houses in Plimmerton. ( See site 30 George Troup.) . However there is currently no supporting evidence to say the house was built prior to 1916 or if Charles and his wife ever lived there. On May 17th 1915 the Troup/Moore/McKay syndicate then sold the property, Lot 79, to Robert Hird Hustler, a painter from Johnsonville. Hustler took a mortgage out on the land on 28 February 1916, possibly to build the house. The property was then sold in 1918 to Juanita Heather Sylvia Craw, a Linton spinster whose brother Eric Hector Craw was killed in action during the Battle of the Somme on 25 September 1916. She was likely to have created the name Somme House. Somme House has been owned by the current family since the early 1940’s. The houses section extends to nearly the top of the bluff behind the house and is mostly comprised of steep land. Although the neighbouring houses are so close and Moana Road runs over the former beach area that was the original front yard for the house, the building and its immediate setting , can still be seen and understood much as it was built. 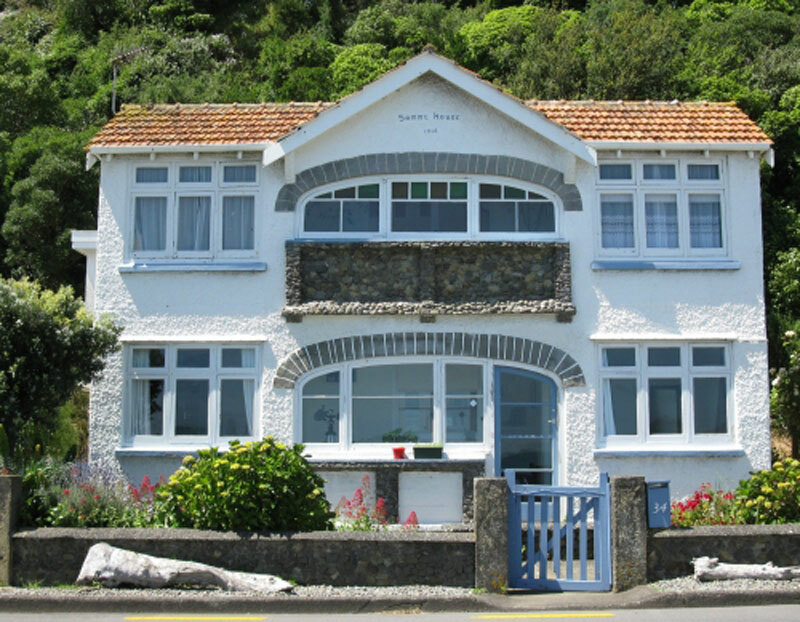 Somme House is a distinctive local landmark in Plimmerton. One of the larger and older houses in the area it is a substantial looking building, two storeys high with a gable – ended Marseille tile roof, rough cast stucco over mass concrete and timber joinery. The house has technological interest for its solid concrete construction at what was then an isolated site. During construction the cement was trucked out in bags from Wellington via Pauatahanui Inlet and Grays Road to Motuhara Road. The bags were sledded down the bank from Motuhara Road and mixed with shingle from the beach to make the concrete as Moana Road had yet to extend this far. The addition of the upper house story in the north east corner is 1950’s era. While in scale with the house and finished in a reasonably compatible monolithic material- fibrolite , it has a flat roof and different joinery from the original house. To the left there is a single storey garage with a mono pitched roof which was relocated from The Terrace in Wellington at an unknown date.